The creation of this annual ECSHA community service project, started in 2009, is part of our organization’s goal of serving the needs of women of all ages. It is an inspired idea organized as a lending library closet of prom dresses and accessories for local high school girls in need of a gown for those end-of-the-year special school occasions. The idea came from Eileen Kremler of Gloversville, NY who donated 50 previously worn prom dresses to start the ECSHA collection, organized by project coordinator Nancy Baird Brown. St. John’s Episcopal Church in Johnstown graciously agreed to store the gowns and offered us a room for displaying them on dress selection days. 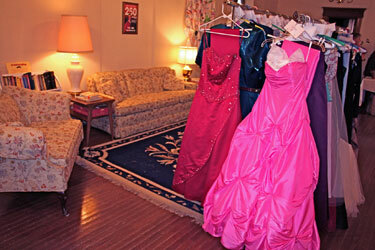 Once the word spread that we had a use for prom dresses, donations poured in from closet-cleaners everywhere. Each borrower leaves a $30. deposit for her selected items, which is returned when she brings them back after prom season. We offer dress selection dates in January through April. In June the gowns are cleaned and stored for the following year’s special events. Also, search Elizabeth & Eileen's Closet on Facebook for additional announcements . Check our ﻿Facebook group﻿ for hours or call Anna Holland for an appointment.